The Honda Insight was one of the most awaited cars of 2009. It disappointed pretty much everyone and was quickly forgotten about. 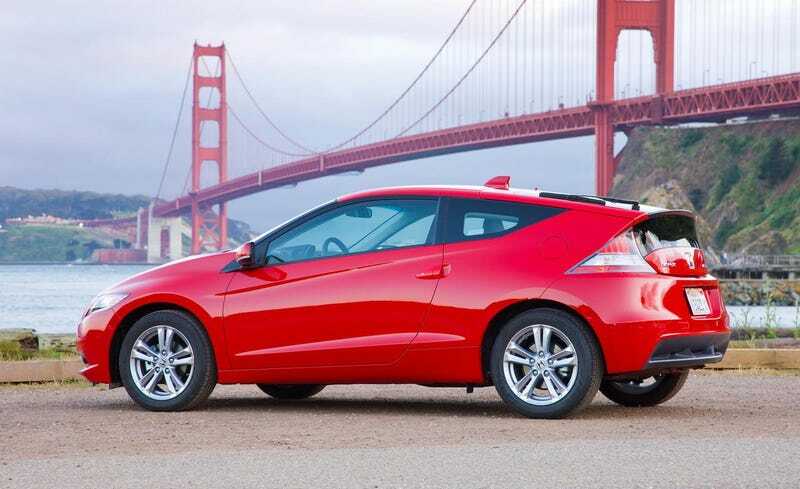 The Honda CR-Z was one of the most anticipated cars of 2010. It disappointed pretty much everyone and has quietly sat in the lineup ever since. One of these cars is worth another try. Over at Automotive News, Hans Greimel penned a piece about the redundancy of the Honda Insight upon the news it's being dropped in Europe. He wisely hits on points I made when we heard rumors the Insight was going to be dropped from the U.S. selection of Hondas pretty much as soon as inventories dry up. There's the very issue of the 2015 Honda Fit. No, we don't get the hybrid. But the most efficient gas version will do 41 MPG. The Insight is only rated at 44 MPG highway. And that Accord Hybrid, while much more expensive than an Insight, is rated at 50 MPG. The CR-Z does even worse than an Insight on fuel. But the CR-Z is the Honda hybrid that needs to be saved. Thanks to up-to-date engineering at Honda and the change in thinking that hybrids aren't the only way to good fuel economy, a CR-Z made now could be a whole lot better. At its launch, Honda insisted this two-seater was a "responsible sports car." What would be even more responsible would be to drop the electric weight out of it and plug in one of the small turbo fours in the pipeline for future Hondas. Weirdly, that would also go some way towards making it more of a sports car. And they could just stick some boost on any CR-Z, hybrid or not. Look, it's a sporty car. It needs some power. In an odd twist of fate, Honda probably has more of the necessary pieces and consumer demand to build a true successor to the Honda CRX than it did roughly a decade ago when the CR-Z was being designed. A downsized, turbo'd, de-hybridized CR-Z is just the car to prove Honda can still make more than mainstream boxes. Too bad they didn't sell more of the current CR-Z to make it a better business case.